Aaron Jasper fishes an average of 200-250 days a year, and has been fly fishing since the age seven. He really lucked out when he began fly fishing, because his Aunt was an acquaintance of Lefty Kreh through his photography seminars. In the beginning Aaron was lucky enough to be given several lessons, at fishing shows, from Lefty. He remembers the 3 flies Lefty had personally tied, which he gifted to a young Aaron, and he of course fished them on the Flat Brook in New Jersey. All those masterpieces eventually ended up in the same tree. Aaron Jasper has found through countless hours of testing and practice that European nymphing techniques require an investment in time to learn but are very often unequaled in their fish catching potential. Find out Aaron's secrets as he explains a variety of Euro-Nymphing techniques including short leader Czech methods to longer leader Spanish and French techniques. Find out Aaron's secrets as he explains a variety of Euro-Nymphing techniques including short leader Czech methods to longer leader Spanish and French techniques. Aaaron Jasper goes where the fish are and most of the time it’s under the surface. He’s spent the last few years studying, researching and testing old and new nymphing methods. On this show we explore many of those methods including the latest in European nymphing techniques. New York City area is one of the most densely populated areas in the country. However, if one were to take a map, a pencil compass and make a 90 mile circle around New York City there are hundreds of high quality fly fishing streams within this area. Join us as we take a tour of some great fisheries in New York, New Jersey and Pennsylvania all within a short drive of the 'Big Apple'. Aaron Jasper is known for finding and hooking up with big fish and what better place to do this than tailwaters. Most of the world's tailwaters can be fished any time of the year so listen in as Aaron shares his tips and tactics for fishing these super productive waters. A major influence in Aaron Jasper's life was his grandpa who taught and mentored the young fly fisherman. Aaron fondly remembers his grandfather as a true Trout Predator on the stream. Even though he was many years Aaron's senior, Aaron recalls that he was tough to keep up with. He was like a vacuum cleaner on a trout stream, catching everything in his path. He also taught Aaron that no matter what he did, to do it on an all or nothing basis, and to be the best at what he does. Grandpa showed Aaron how to catch tons of trout on bait, lures and flies. To this day, Aaron recalls that he has never seen anyone who could match his grandpa's skill at catching trophy stripers, he was amazing. All of this was passed down from Grandpa Jasper to Aaron during countless fishing trips together. 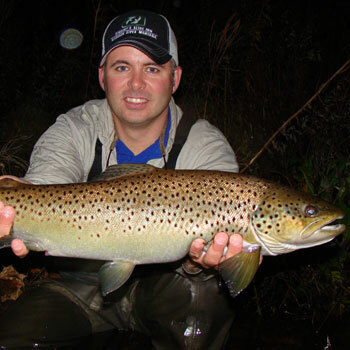 Aaron's early fly fishing took him to New Jersey trout streams such as the Flat Brook, Ramapo and Pequest Rivers. Since that time, Aaron has been fortunate to fish some of the greatest trout streams around the country, fishing extensively in the Eastern United States, as well as travelling across the country to experience some of the very best fly fishing available out West. As a result of his travels, Aaron has learned many techniques, flies and rigs that have enabled him to constantly grow and improve as a fisherman. In recent years, thanks to his very close friend Davy Wooton, Aaron has become a true student of many European nymphing techniques and other methods of trout fishing. Along with traditional style wet fly fishing, Aaron has become a great source of Euro-Nymphing (European nymphing) knowledge. Aaron is always happy to demonstrate a variety of Euro-Nymphing techniques from short leader Czech methods to longer leader Spanish and French techniques. While this style of fishing is an investment to learn, it is very often unequaled in it's fish catching potential. Aaron enjoys fishing in many different conditions, because he enjoys the challenge. Whether it's snowing or freezing cold, you will find him fishing. If the streams are blown out, he will be there. He fish in these extreme conditions to find new techniques that will work, and Euro-Nymphing's versatility has allowed Aaron to really perfect his fish catching abilities, regardless of conditions. When one truly understands and masters the variety of extremely versatile methods encompassed in the world of Euro-Nymphing, you have the power and potential to catch more trout, on any outing, anywhere, regardless of condition. To learn more about Aaron Jasper and his fly fishing techniques visit www.troutpredator.com.